Friday I was following my husband home from a tire company…. I fell into a pot hole and had to have my tires balanced. Not the first time … in our little town that is a common occurrence right now. As we were leaving the parking lot, I noticed something “jumped” on the back of my husband’s SUV window. 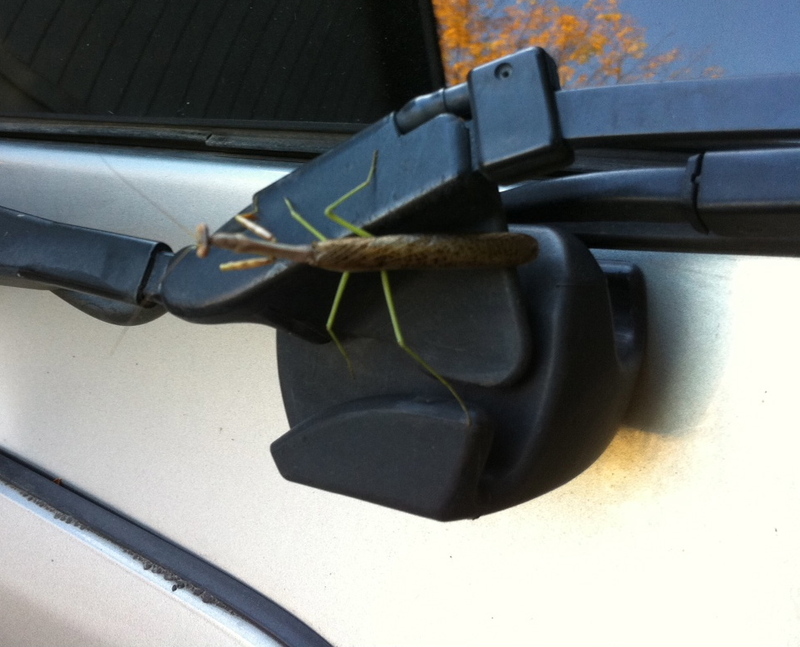 I got as close as I could without hitting his car and saw it was a praying mantis. Yes, a 3” praying mantis. Our trip home was 5 miles through the country, on curvy roads that pass corn and soy bean fields. The “mantis” was holding on for dear life. How did he do that? We were not driving slowly! He must have an amazing grip and be ALL PRAYED UP! Wikipedia says… Mantises have two grasping, spiked forelegs in which prey items are caught and held securely. Located at the base of the femur are a set of discoidal spines, usually four in number but ranging from zero to as many as five depending on the species. These spines are preceded by a number of tooth-like tubercles, which, along with a similar series of tubercles along the tibia and the apical claw near its tip, give the foreleg of the mantis its grasp on its prey. That’s how he did it! He was born to hold on for dear life! “Tooth-like spines & apical claws” sounds kinda scary for such a cute, little guy–don’t you think? Great story! I was driving to work one day, going 65 (yeah, right!) up the highway- when I noticed a beautiful green caterpillar on my hood- as if he was a hood ornament. Unfortunately for me, I didn’t have my camera. Unfortunately for her, even though I slowed down- she didn’t have the grip your praying mantis did! Sorry for your caterpillar. That praying mantis had quite a grip. Just took a peek at your blog. Nice.